Hippocampus erectus is distributed in the western Atlantic from the southern tip of Nova Scotia, Canada, south along the east coast of the United States, Bermuda, the Bahamas, and throughout the Gulf of Mexico and Caribbean Sea to Bahia, Brazil. 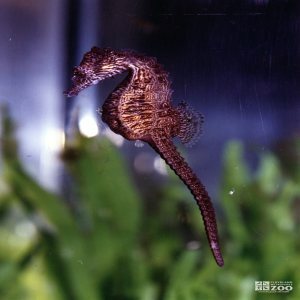 These seahorses live in water up to 100 meters and are associated with aquatic vegetation such as mangroves, seagrass, as well as coral, rocky and oyster reef habitats, and sponges. They can be found at the surface and bottom of both shallow water and deeper areas of channels in bays, along beaches, in or near salt marshes, anchialine lakes, and over oyster beds and weed-covered banks. Average brood size for them is 250 to 300 eggs, which then are deposited into the brood pouch of the male. Newborns are released by ejection from the brood pouch by body contortions and pumping action of the pouch. They have vital parental care and high site fidelity. Their social behavior is highly structured social behavior. Hippocampus erectus is ovoviviparous, and males brood the young in a pouch prior to giving live birth. They become mature during the first reproductive season after birth at six to twelve months of age. There is little known about their feeding, but it is believed that they eat mysids, amphipods, copepods, and gammarid shrimps.